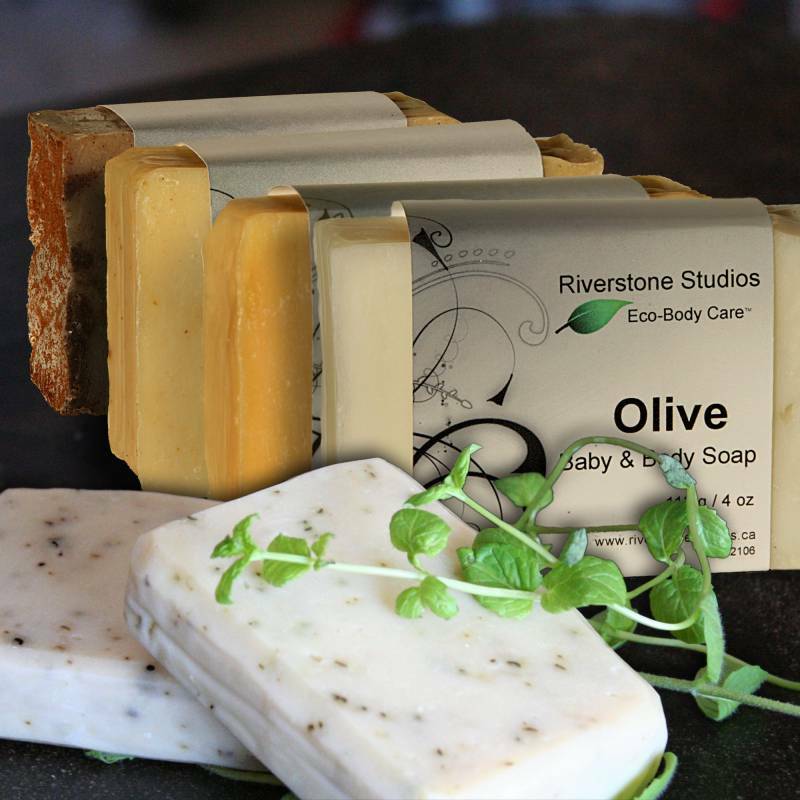 Mix and match your favourite 4oz bars of Riverstone Naturals Organic Vegan Soaps. Just leave us a note when you check out on which soaps you would like us to include. 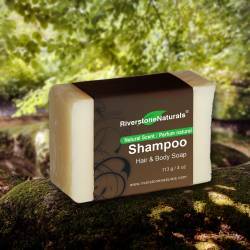 Choose from Activated Charcoal & Tea Tree, Cinnamon & Clove, Honey, Olive, Peppermint Olive, and our Riverstone Naturals' Shampoo Bar for the most amazing naturally soft skin! Excellent choices for normal, dry, oily, sensitive and baby's skin. Please tell us your selection of soaps in "special instructions" in the checkout. Send us an email with your selection of soaps. We will thoughtfully select a variety of beautiful soaps for you. 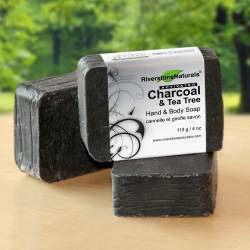 Riverstone Naturals Activated Charcoal & Tea Tree Soap is ideal for oily and acne-prone skin. Handmade with the healing benefits of Activated Charcoal, Bentonite Clay and Tea Tree Essential Oil for an effective soap that gently removes grime, excess oils and grease (if you're a mechanic - you'll be amazed!) Activated Charcoal & Tea Tree Soap provides a good lather with the exfoliating benefit of Activated Charcoal right in the bar. Effective for face, body, and hair. 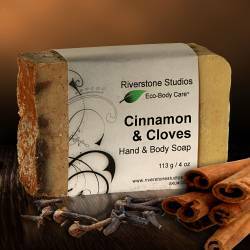 The invigorating aroma of fresh ground cinnamon & clove awaits you in Riverstone Naturals all natural, handmade coconut based soap. PH balanced for the entire family. 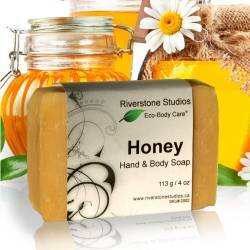 Cinnamon & Clove Soap is great for sensitive, normal and dry skin, providing slight exfoliation and a soft, gentle wash.
Riverstone Naturals handmade Honey Soap is an extremely moisturizing and soothing wash for the face and body. Made with locally sourced honey (neighbors next door - can't get any more local:), for a radiant natural glow. Honey Soap is an ideal facial soap for oily, normal, and sensitive skin. Our gentlest handmade soap. 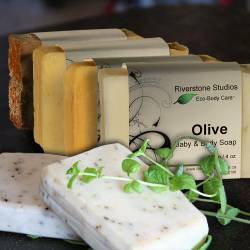 Made from extra-virgin olive oil, Olive Soap is renowned for its gentle moisturizing lather and timeless healing qualities. 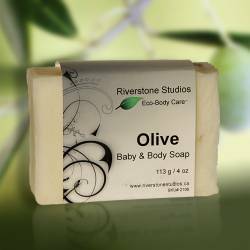 Olive Soap has been effective for conditions such as eczema, psoriasis and cradle cap. Formulated for dry, sensitive and baby's skin and scalp yet suitable for the entire family. 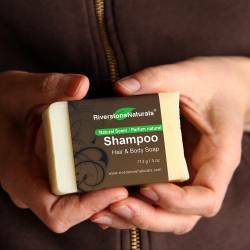 Riverstone Naturals Peppermint Olive Soap offers the gentle cleansing of our Olive Soap with the added healing benefits of Peppermint Essential Oil. Suitable for normal, dry, and sensitive skin and has been especially helpful in healing and moisturizing skin affected by eczema and psoriasis.